The historic centres of Porto and Vila Nova de Gaia while being divided by administrative borders have a territorial continuity. This paper aims to address the recent urban dynamics and transformations in Gaia, including the ones that occurred in the port wine cellars, which occupy about 60% of Gaia's historic center. In a short period of time, the fast spread of a large amount of accommodation, restaurants and other spaces of consumption is gradually leading to a new monofunctional urban zone. Besides, the intervention in buildings’ structures also deserves a reflection: refurbishments have increased while the loss of authenticity and the demolition of buildings have been observed, with irreversible effects on the historic ensemble and on the loss of the identity of the historic centre. Aguiar, J. (2016), “O avassalador consumo patrimonial”, Pedra & Cal, (60), p.66. Bauman, Z. (2000), Liquid Modernity, Cambridge: Polity Press. Choay, F. (2015), Alegoria do Património, Lisboa: Edições 70. 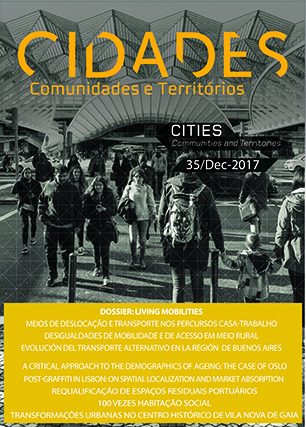 Dias, F. (2011), “Estatísticas de Turismo Urbano. O centro histórico do Porto e o Turismo”, paper apresentado no Seminário Centros Históricos: Passado e Presente, FLUP, 10-12 de Março de 2010, Porto. Domingues, A. (2016), Porto Património Mundial 20 Anos 20 Imagens 1996-2016, Lisboa: Imprensa Nacional-Casa da Moeda. Ferreira, L., Teixeira, J. L. (2011), “O valor patrimonial das alterações introduzidas no edificado habitacional da cidade histórica” paper apresentado na Conferência de Património em Construção - Contextos para a sua Reabilitação, Laboratório Nacional de Engenharia Civil, 25 - 26 de Novembro de 2011, Lisboa. Giovannoni, G. (1913), Città vecchia ed edilizia nuova, Milão: Nuova Antologia. Harvey, D. (2001). “Heritage Pasts and Heritage Presents: temporality, meaning and the scope of heritage studies”, International Journal of Heritage Studies, (7-.4), pp. 319-338. ICOMOS (1976). ICOMOS Charter on Cultural Tourism. Disponível em: https://ace-notebook.com/international-cultural-tourism-charter-free-related-pdf.html. ICOMOS (1999). International Cultural Tourism Charter. Managing Tourism at Places of Heritage Significance. 12th General Assembly in Mexico, October 1999. Medhurst F. and Lewis, J. P. (1969), Urban Decay: an analysis and a policy, London: Macmillan. Rivera Blanco, J. (2001), De Varia Restauratione: Teoria e História de la Restauration Arquitectónica, Valladolid: Valladolid R&R. Short, J. R. (2007), Liquid City: Megalopolis and the Contemporary Northeast, Washington: Research for the Future. World Travel & Tourism Council – WTTC (2016), Travel & Tourism Economic Impact 2016 Portugal, London: Oxford Economics.